"Fans of analog music were dealt another blow when consumer electronics company Panasonic announced earlier this month that it would be discontinuing the audio products within its Technics brand, most notably the legendary line of analog turntables. On October 20, the company said that it was winding down production of the Technics SL-1200MK6 analog turntable, the SH-EX1200 analog audio mixer and the RP-DH1200 and RP-DJ1200 stereo headphones due to challenges in the marketplace. “Panasonic decided to end production mainly due to a decline in demand for these analog products and also the growing difficulty of procuring key analog components necessary to sustain production,” the company said in statement issued to The Tokyo Reporter. Last year, Japan’s last remaining vinyl pressing plant, owned by the production company Toyo Kasei, produced around 400,000 discs from its multifloor factory in Yokohama’s Tsurumi Ward, a far cry from the industry’s peak of 70 million four decades ago. Panasonic said that sales of analog decks today represent roughly 5 percent of the figure from ten years ago. At present the company has no plans for putting analog turntables back on the market. The SL-1200 series turntable, which enjoys a massive following in the DJ community, had been in continuous production since 1972. Since then 3.5 million units have been produced, making the brand’s purple and gray logo (“Technics” written twice) an icon in clubs. 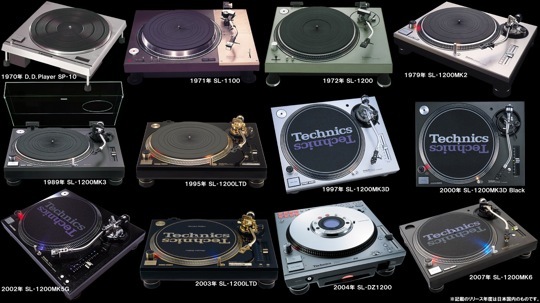 The turntables are acclaimed for their quick start-up and reliability, achieved through its durable Direct Drive turning mechanism (via magnets, as opposed to being belt-driven) and its heavy 12.5-kilogram base (composed of what is known as the Technics Non Resonance Compound), which isolated the platter so as to reduce feedback and the chance that the cartridge would jump. Japan’s DJ community was abuzz, notably on the social-networking site Twitter, following the announcement. Tatsuo Sunaga (dubbed “The Record Chief”) said in an email that the announcement was unfortunate. But even if turntable manufacturers targeting top DJs continue to shrink their output, Sunaga sees those who prefer analog today as being too obsessed with the format to allow it to become extinct. “I don’t think analog users will lose interest,” he said. Regarding the Technics brand itself, nothing has been decided other than the discontinuation of the mentioned products, the statement said."